The team here at MLD has been on a bit of a break for the holidays, but tonight’s Raw from Memphis, Tennessee promises to be a big night with the return of a Superstar that has been building for weeks. A lot of rumors and speculation surround this particular mystery that has come primarily in the form of YouTube videos and we’ll get to our short list of possibilities within. 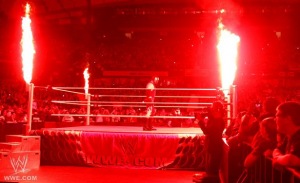 Last week’s show from Chicago was a mixed bag to end 2011 and we’ll get to all the major spots from last Monday’s Raw in Chicago as well. Things are steadily building toward the annual Royal Rumble, and WrestleMania of course, but the real story tonight is the “return” we’ve been informed of through a set of mysterious videos for over a month (they began all the way back on November 21, 2011). Just reading that sentence makes any guess other than the Undertaker seem like a long shot, but everyone from Kharma, Shane and Stephanie McMahon, Brock Lesnar, Batista, Chris Jericho, and Sting have been suggested. Tonight should open with this reveal or at least speak directly to it. Unless it’s Brodus Clay in which case they can continue to wait. Undertaker is my guess, but that will be so disappointing somehow. Jericho is a realistic pick that I’d love to see and Sting… well how could anyone not want to see that? Kharma is an interesting possibility that’s been thrown around and that could make for a far more interesting Divas division. She did have a lot of hype around her debut. Whoever it is, hopefully their debut is handled better than last week’s show which ended with John Cena confronting Kane rather than C.M. Punk in front of a raucous Chi-town crowd. The excitement surrounding last year’s Money in the Bank pay-per-view in Chicago is arguably a big part of what led to us starting these weekly “Warm Ups” and the show returning there in front of a sold out crowd should have been spectacular. Tweaking them by sending out John Laurinaitis was great at the top of the show, but the night should have ended with Punk’s gauntlet match against Jack Swagger, Dolph Ziggler, Mark Henry to get to Laurinaitis himself. It’s possible Cena ended the show so it didn’t seem like the gauntlet match was rushed into the last segment or the show’s bookers didn’t want to send the crowd home on a Punk loss. Chicago got to see their guy win big at Money in the Bank and they could have handled the show ending on a loss to Ziggler that puts him in the main event with a title shot tonight. I can’t believe the fans really go away happier booing Cena out of the building as the show went off the air. Other highlights from last week that we should see more of tonight include the Booker T versus Cody Rhodes rivalry that surprisingly gets more interesting each week. 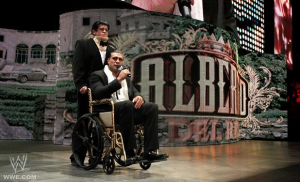 It’s an uncommon case where a Legend versus Superstar feud really has some traction. WWE did a good job with Jerry “the King” Lawler and the Miz around this time last year (or was that two years ago?) and this has potential to be another fun ride. Zack Ryder embarked on a new program with Eve, but I can’t help but think this hurts his momentum a bit. A rematch with Ziggler is unlikely as he enters the main event picture and Ryder needs a solid feud to keep things going. 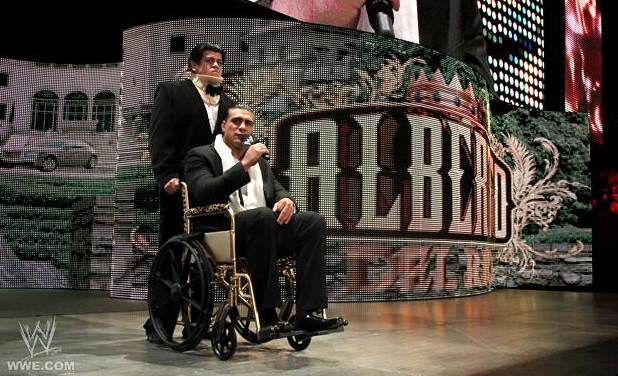 It appears Alberto Del Rio will work through his recent injury, as he appeared in a wheelchair along with Ricardo Rodriguez in a neck brace last week. 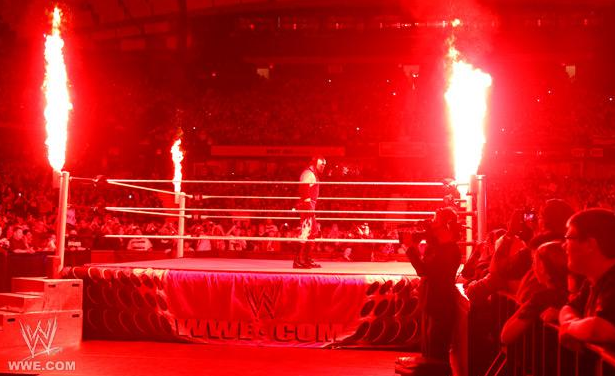 The returning R-Truth also took out the Miz after a few weeks away from action. Hopefully we’ll get more on all of these angles along with a satisfying reveal tonight in Memphis. The first Monday Night Raw of 2012 begins tonight at 9PM on the USA Network and could be a strong start to the new year for WWE. Below is a collection of each week’s videos that have led up to tonight’s “return” along with links to our comments, questions and observations from week to week. It begins. November 21st, 2011. Look within. December 5th, 2011. The end begins. December 26th, 2011.